The Academy of Oncology Nurse & Patient Navigators (AONN+) is having quite an eventful year, and we are excited to share the goals we have met and our achievements thus far. Since the last State of the Academy, delivered in the beginning of 2018, AONN+ has added an impressive list of milestones and accomplishments to our resume. As the largest nationally recognized organization for oncology navigators, we are steadfast in our position that oncology navigation is the future of cancer care. With this in mind, the AONN+ Leadership Council has been working overtime to foster the purpose of our profession and raise our voices in the cancer community. The members of the AONN+ Leadership Council are diligently advancing the discussion around navigation and its importance in the oncology care continuum on a national level. In 2017, AONN+ acquired national appointments, forged health system and alliance partnerships, and grew our organization. Read about these achievements and more in our 2017 Annual Report. AONN+ is strengthening the mutually beneficial partnerships we formed in 2017 with the American Cancer Society, Midwest Cancer Alliance, and Sarah Cannon. These organizations are instrumental in providing us with the resources to meet some of our goals. In turn, we continue to provide the navigators from these organizations with access to valuable professional enrichment opportunities. This year, AONN+ continues to build strategic partnerships to advance our mission and the navigation profession as a whole. We are pleased to announce that the Academy has recently joined the Cancer Leadership Council (CLC), one of the nation’s leading oncology policy and advocacy coalitions, to bring oncology navigators’ perspective to advocacy discussions and impact policy decisions. In March, the Academy had a strong presence at the first of the Biden Cancer Initiative’s “Conversations with Dr. Biden,” hosted by Co-Chair Dr. Jill Biden. 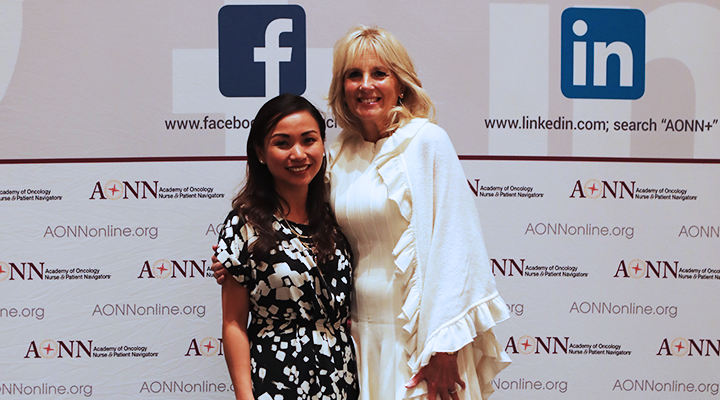 Danelle Johnston, MSN, RN, ONN-CG, OCN, Chief Nursing Officer and Senior Director of Strategic Planning and Initiatives for AONN+ and The Lynx Group, was among those in attendance. As a member of the Biden Cancer Initiative’s Advisory Committee and the leader of its patient navigation working group, Ms. Johnston aims to leverage the AONN+ navigator network and get them involved in these conversations. AONN+ welcomed a significant number of new members this year, and our membership has ballooned to 7,109 strong! To date, AONN+ has 5,956 nurse/clinical navigators, 1,044 nonclinical/patient navigators, and 109 administrators. With such growth in AONN+ membership, we created new ways to provide more opportunities for our members to connect with other navigators, as well as the AONN+ leadership. Our official AONN+ Facebook Group allows members to easily share oncology care ideas and experiences in their professional lives, provides an easy way to make logistical arrangements for AONN+ conferences, and is a conduit for local navigator network (LNN) leaders to reach local navigators. Since the group’s launch, our members have privately enjoyed insightful discussions on how to tackle specific scenarios they have encountered as navigators, as well as on new trends in oncology care. In addition to the Facebook group, we have launched a channel called WWLD – What Would Lillie Do? Inspired by the matching t-shirts worn by members of the Kansas City LNN at the Kansas City Summit in May, WWLD invites navigators to reach out to AONN+ Program Director and Co-Founder Lillie D. Shockney for practical solutions to specific situations. AONN+ is in a collaborative partnership with Oncology Solutions, LLC, and the American Cancer Society, which has executed a national, multisite navigation metrics quality study. To address the need for standard oncology navigation measures and support for consistent implementation, analysis, and reporting, a study has been launched that will assess the reliability and validity of 10 of the 35 Standardized Evidence-Based Oncology Navigation Metrics developed by AONN+. These 10 metrics were selected because they dovetail with national standards and accrediting programs, and are key measures that will provide foundational benchmark data for navigation programs. This study will also assess the barriers and challenges navigation programs encounter during the implementation of navigation metrics. “We look forward to collecting and reporting on these data as part of our continued efforts in building a strong, sustainable business case for navigation programs,” said Ms. Shockney. The AONN+ Certification Task Force chairs are working assiduously to meet requirements to obtain the American National Standards Institute accreditation for the Oncology Nurse Navigator–Certified Generalist℠ (ONN-CG℠) certification and the Oncology Patient Navigator–Certified Generalist℠ (OPN-CG℠) certification exams. The Academy expects to receive national accreditation for the ONN-CG℠ and OPN-CG℠ exams in 2019. In June, the Journal of Oncology Navigation & Survivorship (JONS) debuted a fresh look with a redesigned website, which can be accessed through the same web address: www.JONS-online.com. The redesign features a responsive layout and streamlined navigation, along with improved user interface and user experience. The Academy is committed to delivering career enrichment opportunities to our members. Our webinars are specifically tailored to help navigators earn continuing education credits, become better oncology care professionals, and ultimately, deliver an optimal patient experience. The next webinar will be in September 2018. Stay tuned for announcements. Access our library of CME/CE activities and webinars and earn CE credits. Headed by Co-Chairs Penny Daugherty, RN, MS, OCN, ONN-CG, and Peg Rummel, RN, MHA, OCN, ONN-CG, the AONN+ Conference Planning Committee ensures that our conferences provide relevant and high-value agendas and speakers that will enhance and develop the professional growth of our attendees. Thanks to their dedication and commitment, the AONN+ Annual Conference will once again be filled with informative sessions and exciting events. Mark your calendar and plan to join us November 15-18, 2018, in Dallas, TX, for the Ninth Annual Navigation & Survivorship Conference. At the conference, we will delve deeper into the AONN+ standardized metrics, the ever-growing field of immunotherapy, and the latest developments in oncology care. It’s the premier event for industry professionals that you do not want to miss. Register today! AONN+ is proud to serve the needs of our growing navigation community, and we are looking forward to what’s in store for us for the rest of the year, and for 2019. Please share this information with your peers who may be interested in becoming members of our organization. The Lynx Group announced today that Digital Communications Manager Carol Bustos has been nominated for a 2019 Folio: Digital Award. Jessica Morris, whose two-year experience with brain cancer led her to create OurBrainBank, a nonprofit organization in support of people with glioblastoma.